Hello to allie J. readers and welcome to those stopping in from Sewing the 60s or Style Sixties! Despite the fact that we all sew primarily from vintage 1960s patterns, we couldn't find a pattern that all three of us owned! We decided instead to sew the same style--shift dresses with a collar and cuffs--without worrying about the patterns we were working from. After all, there are about 1000 shift dress patterns and I know we each have our favorite tried and true fits. I turned again to Simplicity 7737 and then (oops!) blatantly copied a dress Sarah made last year since I had a nice hunter green plaid in my stash already! I thought about using Simplicity 7194 (the pattern I used for my "Lilly" dress) but I wanted to minimize the pattern matching I had to do, so princess seams were out. The original Simplicity 7737 has two sleeve variations: short sleeves (which I've used in my previous versions) and "long sleeves gathered to snapped cuffs." I swapped these out for the sleeves from McCall's 6969 using the technique (and sleeves!) I used for my secretary laurel. This dress has a sneaky secret... the collars and cuffs are removable! 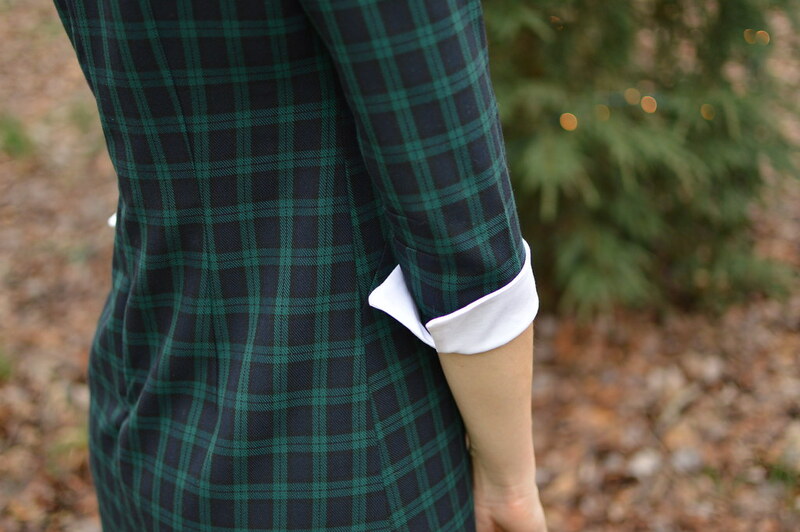 Many patterns of this era have "removable" collars and cuffs, including my sleeve pattern of choice. I'll note here that removable just means they are slip-stitched on--so, yes, you can remove them, but it's not, like, a "do I feel like cuffs today?" sort of addition. I decided to stick with the pattern's "removable" cuffs, but switch it up a bit for the collar: I made a dickey! The "collar" of this shirt is actually the top bits of Simplicity 2154 (repro). I picked this one since I had made it before and I knew that it would fit with the neckline of Simplicity 7737 (since I tried them on together before I started) and that it would fit over my head with a little button closure, no zipper. It does feel a bit silly to wear a dickey, but right now, I'm enjoying the versatility. If I wanted to, I could make a whole fleet of Simplicity 7737s and wear my little white collar with all of them. This also means I can launder my white, cotton collar without worrying about the color or fabric of the body of the dress. I do think it's funny because I would never wear one of those combo-look tops (like, a sweater with attached collar to make it look like layers), I think they look so tacky. What do you think? Would you wear a dickey? Sarah and Catherine are some of my favorite bloggers and I know whenever I visit either of their blogs I'm certain to leave inspired. Please do peek at their makes: you can find Sarah's here and Catherine's here. Thanks ladies! ps: i made McCall's 6969 (the sleeves and cuffs of this dress) at the beginning of my sewing career and i remember it being a total flop, but now, i keep thinking i ought to give it another shot. but... could i just be getting sucked in by the adorable pattern illustration again?? pps: thanks to by dad and brother for helping out on this photo shoot! I like this a lot - though I've yet to meet a plaid I don't like! I've never done those super-long French darts. I know they're pretty old (classic?) but they look so fresh! I really like this pattern--it has the long french darts and little bust darts, which allow for a nice fit despite the simple shape of the dress. Coincidentally, I just recently finished a gingham dress with white cuffs and collar too! However mine certainly isn't a sheath style dress. You look so Cute in yours! Your pink dress? It's so cute, I saw it on the Sew and Tell page :) I almost made this one a full skirted dress, but decided to see if I could squeeze two items out of my length of plaid. The pattern I used for the sleeves is a full skirted dress with collar and cuffs though, and it is SO tempting, despite the fact that it has burned me in the past and been super unflattering... those adorable but unrealistic pattern illustrations, they get me every time!!! Ah, I didn't think of the tv accents--we get BBC shows but I can't think of any Aussie shows except "The Librarians" (I think that's the name). I'm impressed you can understand so well, the US and the UK have such wide ranges of accents. I'm sure Australia does too. I heard on the news that the Aussie accent is partially due to heavy drinking back in the colonial days?? Oh my gracious! I adore your dress! The plaid is great. When I first saw the pic I thought, perhaps, you had used Vogue 6881, which I have been staring at for two weeks. Also, I'm jealous of all of you for having sewing buddies! I need to find some 70s sewing buddies asap. That is such a cute pattern!! 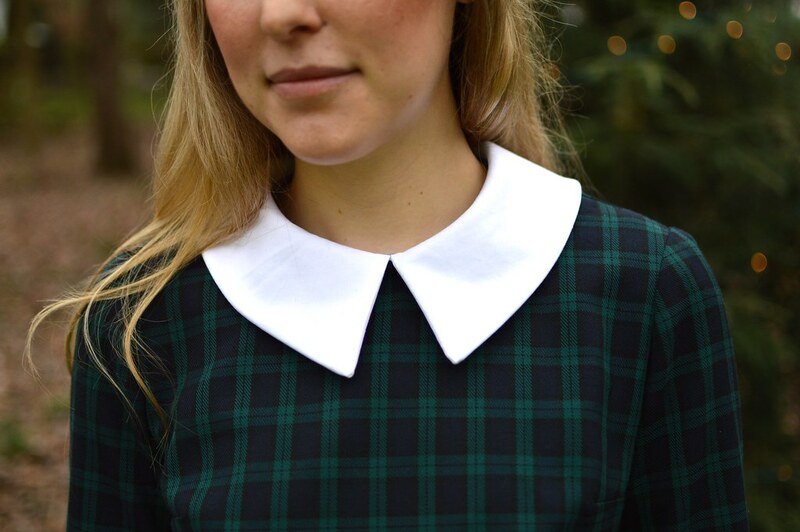 The collar especially looks very similar to the one in the pattern I used for my dickie. I feel like we 60s fans are few and far between compared to 40s/50s sewers, and there are fewer still 70s enthusiasts! Hopefully that will change as Mad Men mania recedes and the 70s become trendier?? Sadly, you rarely see anyone sewing 70s patterns. 70s fashion is definitely on the rise though! I see it often in stores (not that I shop that much, you know, because of sewing and all), and I am in love with the new brand Stoned Immaculate (http://stonedimmaculateclothing.com/). I totally want to blow five grand and buy the whole line! You all did an awesome job!! How cool to find sixties sewing enthusiasts from all over. I'm so glad I found your blog! I was a fashion merchandising major in college and didn't love the sewing class we had to take, but I like the idea of being able to make your own clothes. I just don't have the patience for it. I love seeing your designs on here. Your creativity and talent are just amazing! Need this dress in my life, stat! No dickies here. I momentarily though about a modesty type attachment for my bra for low cut tops, but thought a camisole would be so much more useful. Same for a dickie, I'd rather have a blouse or top for layering. 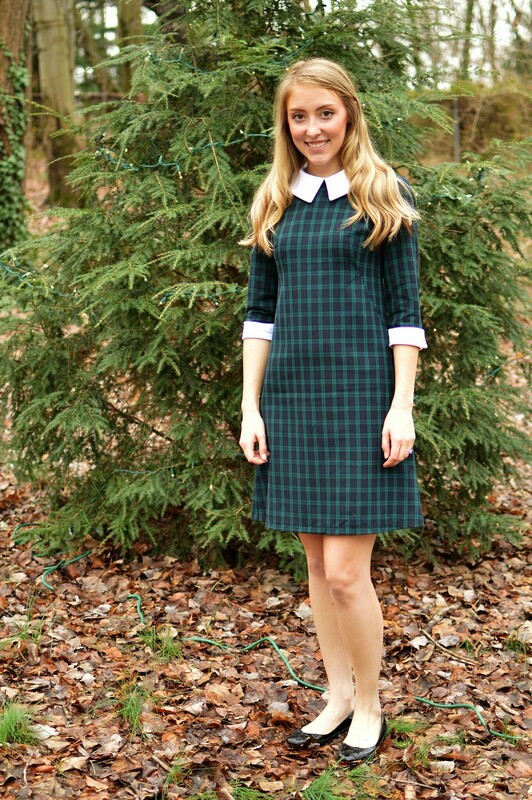 I love this dress and I would totally wear a dickie. Great work!! This is adorable!!!!! I love it so much! The plaid is really sweet, like a fun take on a school uniform for grownups.